This groundbreaking book offers the first global history of the loyalist exodus to Canada, the Caribbean, Sierra Leone, India, and beyond. At the end of the American Revolution, sixty thousand Americans loyal to the British cause fled the United States and became refugees throughout the British Empire. 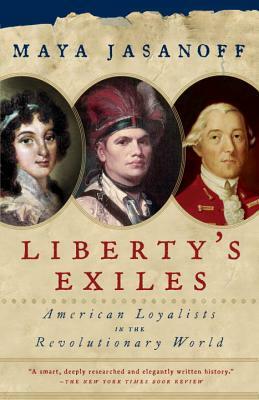 Liberty’s Exiles tells their story. This surprising new account of the founding of the United States and the shaping of the post-revolutionary world traces extraordinary journeys like the one of Elizabeth Johnston, a young mother from Georgia, who led her growing family to Britain, Jamaica, and Canada, questing for a home; black loyalists such as David George, who escaped from slavery in Virginia and went on to found Baptist congregations in Nova Scotia and Sierra Leone; and Mohawk Indian leader Joseph Brant, who tried to find autonomy for his people in Ontario. Ambitious, original, and personality-filled, this book is at once an intimate narrative history and a provocative analysis that changes how we see the revolution’s “losers” and their legacies. Maya Jasanoff is the Coolidge Professor of History at Harvard. She is the author of the prize-winning Edge of Empire: Lives, Culture, and Conquest in the East, 1750-1850 (2005) and Liberty's Exiles: American Loyalists in the Revolutionary World (2011), which received the National Book Critics Circle Award for Non-Fiction and the George Washington Book Prize. A 2013 Guggenheim Fellow, Jasanoff won the 2017 Windham-Campbell Prize for Non-Fiction. Her essays and reviews appear frequently in publications including The New York Times, The Guardian, and The New York Review of Books.